Invisalign™ vs. At-Home Aligners! Are They REALLY Worth It? 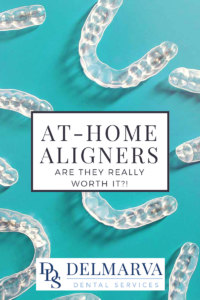 Are At-Home Aligners REALLY Worth It?! Home/Blog / Are At-Home Aligners REALLY Worth It?! Invisalign™ orthodontic treatment involves the patient wearing a series of precision made clear aligner trays that slowly track the teeth into their new positions. The aligners are thin, virtually “invisible”, and BPA free. These features provide the patient comfort and confidence to wear the aligners throughout the day. At-home aligners are created by a remote dental lab that also makes several sets of tight-fitting clear aligners that gradually shift the patient’s teeth into the desired position. The aligners are also BPA free. At-home aligners advertise to be extremely easier than other aligner treatment. The process requires three steps. First, the patient needs to have impressions in order for the dental lab to make the clear aligners and create a treatment plan that will shift your teeth over an average of 6 months. You can either go to one of the many locations they have in metropolitan areas to have a 3D scan completed or you can complete the impressions using an at-home impression kit. Next, after the lab receives your impressions, if completed properly, they begin producing your clear aligners and send them to you along with whitening. After your treatment is complete, you can purchase a set of clear retainers to make sure all of your progress remains. Invisalign™ also only requires three easy steps. First, an orthodontic (ortho) evaluation is completed here in the office to determine if you are a good candidate for Invisalign™ treatment. Once you have been deemed a good candidate, next you will have your ortho workup. Depending a few factors, the evaluation and work up a can be done same day (BOOM! Just saved you a visit!). At this appointment, you will have a series of photos taken, xrays, as well as having impressions taken of your teeth. Impressions are extremely crucial to the process and need to be completed by a licensed professional so they are done quickly and efficiently the first time. This ensures that your treatment will not be prolonged in any way. The dentist takes all of the information and enters it into the Invisalign™ chart for you. Once Invisalign™ receives the impressions and your dentists’ detailed and personalized prescription for your tooth movement, Invisalign™ is able to create a “digital movie” of the movements of your teeth before you begin treatment. You will be able to see this “digital movie” to make sure you are pleased with the results. Next, your treatment begins! You come in to the office to have “attachments” or “bumps” placed on your teeth. This appointment is painless and doesn’t take much time at all. These bumps are the guiding force in making sure your teeth move in the desired positions. The attachments are tooth colored and therefore just as invisible as the aligners. Retainers are provided to patients after treatment to prevent the teeth from moving back into their previous positions. As much as finances are a huge factor, money is not the only cost when it comes to your dental health and needs. The phrase “you get what you pay for” does not just relate to snagging that super low-priced item from Ebay that was described as “lightly used”. This phrase rings true even in the dental world. When deciding if Invisalign™ is the best option for you and you stumble across a retailer promising you the same product, but at a lower rate, your eyes begin to glow and your heart begins to patter, because who doesn’t love a good deal! However, when it comes to your dental health and quality of care, there are many other factors that play into what is the best option for you. 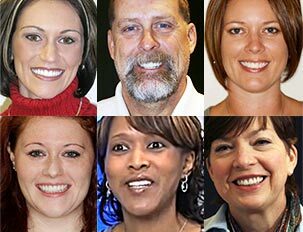 Here at Delmarva Dental Services we make sure that we provide the best care and quality service to our patients. We make every visit feel just like you never left the comfort of your home along with making sure that your treatment is personalized specifically towards you and your needs. We also care about the financial well-being of our patients as well. We offer three different payment plan options through companies such as CareCredit, Wells Fargo, and Lending Club. Each option allows the patient to apply for financing and have the option for 6, 12, and even 18 month interest-free repayment. Our Business Assistants would be more than happy to walk you through these payment options along with helping you apply right here in the office. You can also apply online right from the comfort of your home! So to answer the question, YES, you can afford Invisalign™! All in all, when you look at both clear aligner treatment options it seems that they both are almost exactly the same, but when you look a little further you can see that being able to work with a dentist that is sensitive to your needs and is only a phone call and few miles away is a little more comforting then being subject to treatment over-the-phone or through email only. It is always nice to know that going through this transforming stage in your life is guided by a passionate professional who is willing to go the extra mile to make sure that you are aware, informed, and every need is met along the journey to achieving the results you are expecting!